Gavin Newsom's Ex Is Dating Trump's Son. Does That Impact His Relationship With the President? Democratic gubernatorial candidate Gavin Newsom can hardly be described as a fan of President Trump. Just over a week ago, Trump called Newsom out for his proposal to have California cover the cost of universal health care for undocumented immigrants. Meanwhile, the president has practically made a sport of attacking Gov. Jerry Brown, whose legacy Newsom is expected to carry forward if he wins. Trump and Brown have tussled perhaps most notably over climate change, one of Brown’s signature issues. Trump has called climate change a hoax. With that background in mind, it's worth asking about the fact that Newsom’s ex-wife Kimberly Guilfoyle, who until recently worked for Fox News, is dating Donald Trump Jr. I asked Newsom about it not because it would make for good tape. (At least not entirely.) The unexpected connection between the front-runner to be California's next governor and the current occupant of the White House may be the talk of California’s political class -- but Newsom told me I was the first to ask him about it. “What do you think my response is going to be?” Newsom joked. “I appreciate the question,” he said in a voice that invoked Bill Clinton, while even doing Clinton’s signature thumb pump. But it's a serious question. While California’s progressives view their state as a key pillar of "the resistance," could Newsom's relationship with his ex-wife, in an unexpected way, open up an otherwise non-existent line of communication between Trump and Newsom? "I think in those terms I'm still trying to come to grips with all of it," Newsom chuckled. "No it's fine. I wish her well, and them well. And we see the world, clearly, with a different set of eyes politically." 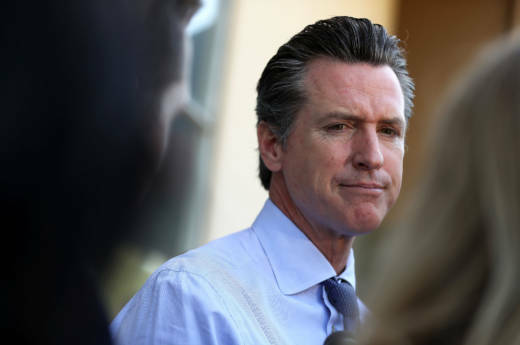 Newsom's answer balanced a stance that belied sympathy with vociferous Democratic rejection of Trump with the necessity of keeping open lines of communication between the governor's mansion and the White House. “I think when you’re asked about Trump as a Democrat, your first response is 'Impeach! Impeach!' But at the end of the day, the responsibility of governing and being the governor of the state of California -- when it comes to disaster declarations, when it comes to getting reimbursed for the hundreds and hundreds of millions of dollars that we’re putting out on these -- you’ve got to have at least some semblance of a relationship," Newsom said. "So my purpose is not to wake up every day looking to get a crowbar to put in the wheels or spokes of the administration," Newsom said. At the same time, Newsom made it clear that as governor, he'd push back strongly when he felt it necessary. “I’ll take a backseat to absolutely no one in protecting and preserving our values,” Newsom told me. “And if [Donald Trump] wants to attack the people of this state, they will have no greater champion than myself. I will push back aggressively. But it’s not my intention to wake up every day trying to pick a fight. Quite the contrary." Make no mistake. The big blue campaign bus I traveled on with Newsom is his ride into some of the state’s most contested districts. He’s likely to win, and he’s spending his political capital on getting tight Congressional and state Legislature races to either stay or turn blue. In public, Newsom isn't likely to stray far from Brown’s approach. But Newsom may have a back channel to the Oval Office that his predecessor didn’t, should he choose to use it.